Restrictions in the exhaust system robs horsepower and torque especially on turbocharged cars. Thus, removing as much exhaust flow restrictions will increase horsepower and torque significantly. The factory catalytic converter found in the factory downpipe is a big culprit of this and is a major exhaust flow restriction. 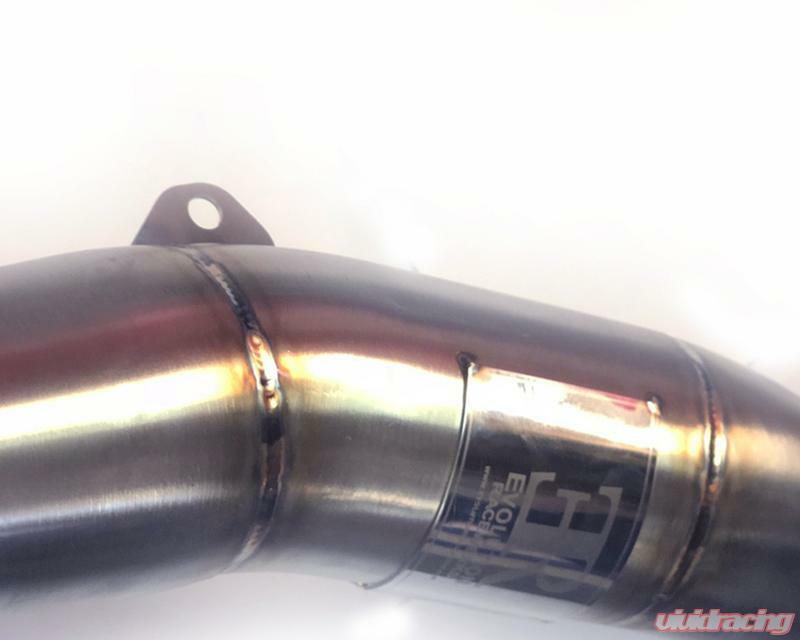 The factory catalytic converter is made up of catalyst material formed into "honeycomb" weaves. Exhaust gas must pass through these tiny "honeycomb" weaves on their way to the exhaust system thus causing a major exhaust flow restriction. It also causes turbulence after the catalytic converter which causes the exhaust flow to slow down (which increases restriction). 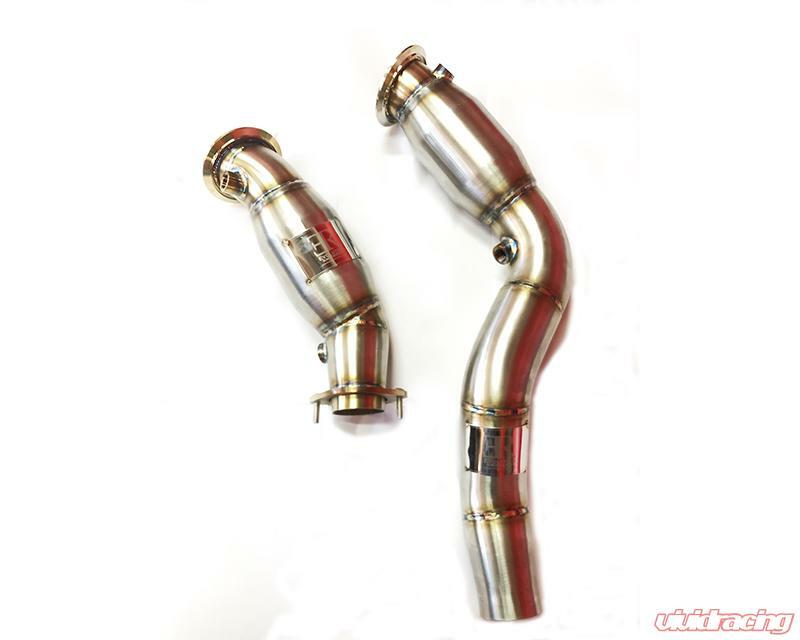 By replacing the factory downpipe/catalytic converter with Evolution Racewerks' Sports Series 4" High Flow Catted Downpipe, more power is unleashed! The factory catalyter uses a 400 cell ceramic core. What the 400 cells means is that per every inch, there are 400 "cells" that the exhaust gas must pass through. Evolution Racewerks uses a 200 cell metallic core. By having less cells per square inch, these individual "cells" are bigger in size thus allowing exhaust gas to pass through it more easier. Thus, the lower the cell count, the higher the flow. Higher flow = more power, faster turbo spool up (less turbocharger lag) and better throttle response. Bottom line, faster. The benefits of a metallic catalytic converter vs a ceramic like the factory is that it can take more heat and is more durable (last longer). They are also lighter than their ceramic counterparts. 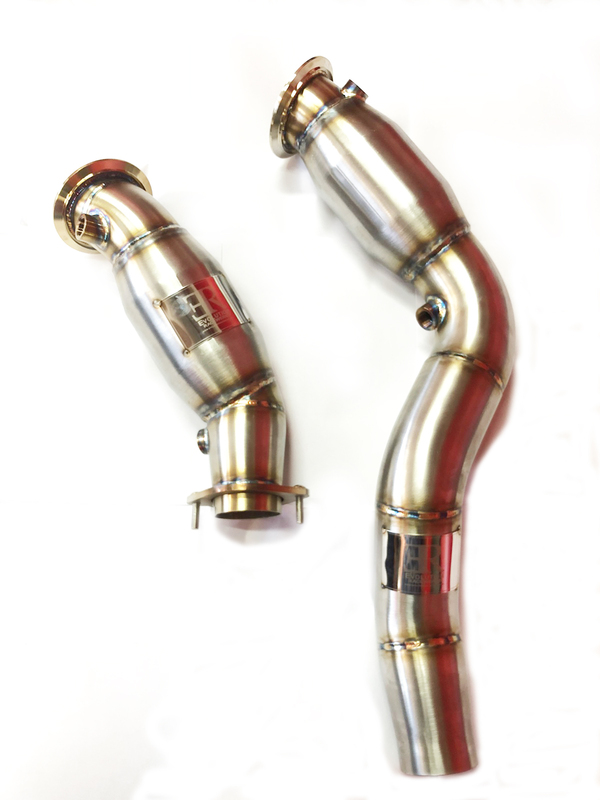 Evolution Racewerks' Sports Series Catted Downpipes is constructed out of 100% 304 grade stainless steel and utilize mandrel bent piping. They are 100% TIG welded by Evolution Racewerks' in house fabricators and built in the USA. 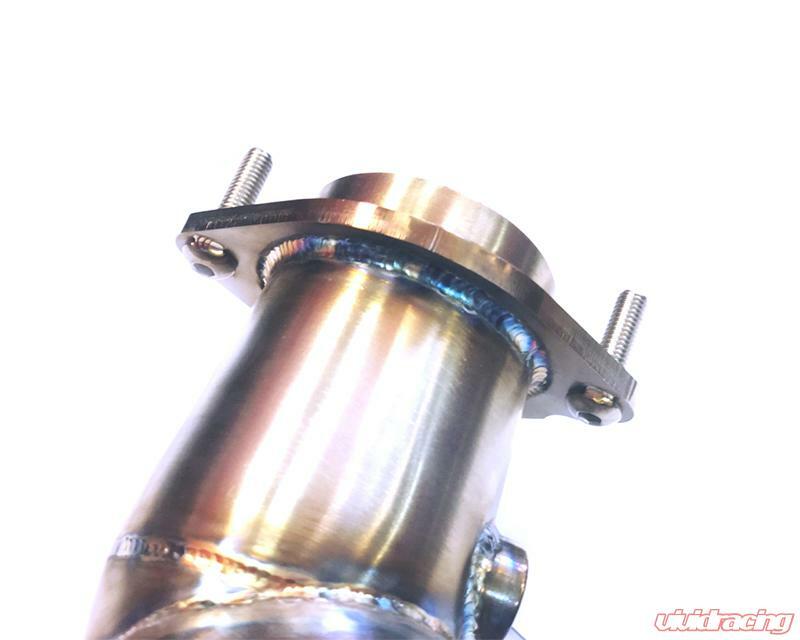 The factory turbocharger turbine housing utilizes a 4" V-Band flange which Evolution Racewerks have duplicated and CNC machined cut out of billet 304 stainless steel. Stainless Steel CNC machined O2 sensor and laser cut brackets are TIG welded using stainless steel rods. The O2 sensor is positioned at the factory location. 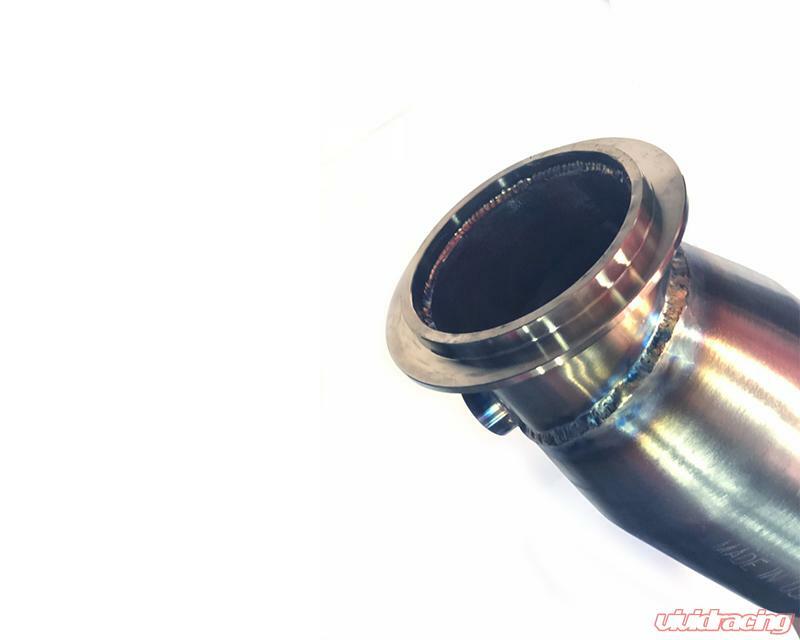 Since the outlet of the turbocharger is 4" and the factory exhaust system is 2.5", the factory downpipes reduces size using short transitions from 4" before the catalytic convert and 2.5" afterwards. Due to space needed for the cataylic converter, the factory downpipes reduce in size using very short transitions. 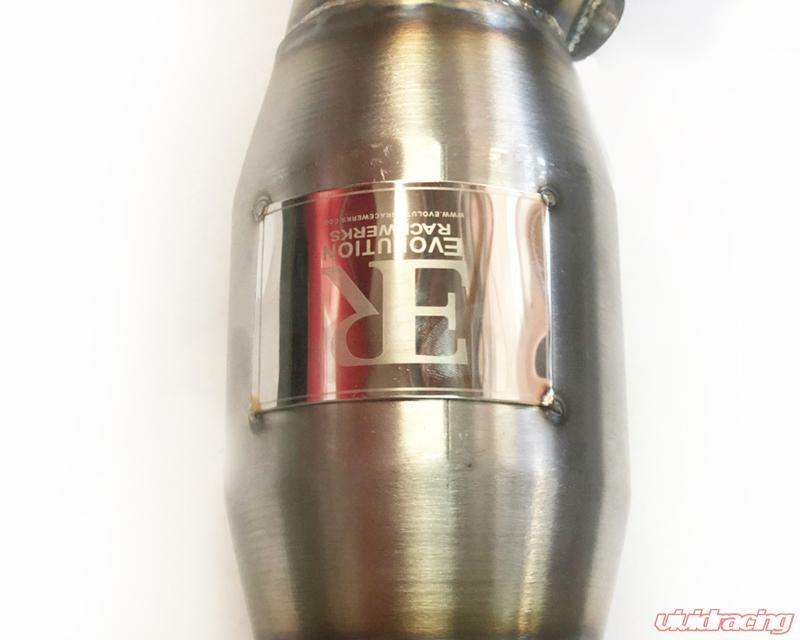 Since Evolution Racewerks' catted downpipes utilize a s more compact cataylic converter, Evolution Racewerks' has more space. Thus, Evolution Racewerks uses very long transitions. These longer transitions allow the exhaust gas time to smoothly transition from the larger piping to the smaller. This results in less exhaust turbulence and backpressure which again improves throttle response and increase turbocharger spool times (less turbocharger lag). Images used for marketing purpose only actual product may vary!